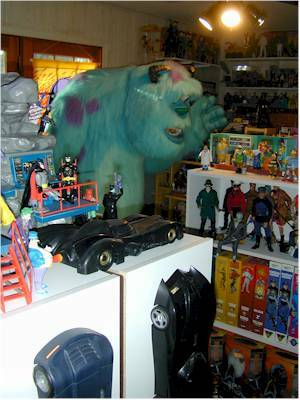 Remember those HUGE Sulley and Mike figures at Toys R Us? 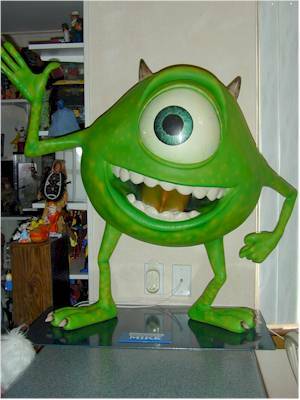 You know, the life size, HUGE versions? They had a contest at each TRU store, in which you could fill out a little form, drop it in the box, and get a chance to 'take home the Monsters'. I entered a few times - I'm not sure how many. It was someplace between 1 and 100, but probably close to 50. Heck, this is a TRU store that's only a mile from my house, and I stop by there at least 2 or 3 times a week on the way home from work. It was easy to fill four or five out, and the contest lasted over two months. I didn't think too much of it either, as I never win anything. Really...I can't remember the last contest I won. But about two weeks ago, I received a letter from Little and King, informing me that if I qualified, I was the winner at my store. Woo-hoo! Of course, I didn't really think about what I would actually do with these things on the bizarre chance I won. 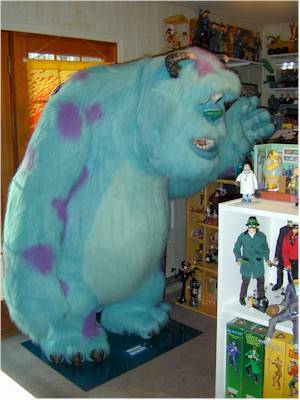 Did I mention that Sulley is HUGE? I went by the store on a Friday night, the same day I received my final letter. I removed his arms and head to get him to fit in the back of the Explorer, and even with all the seats down his feet were still sticking out the back. I roped down the tail gate, but I can only imagine what the other drives on Washtenaw Avenue thought. It did cross my mind, briefly, that I could just take the head and mount it on a plaque, and hang it on the wall. 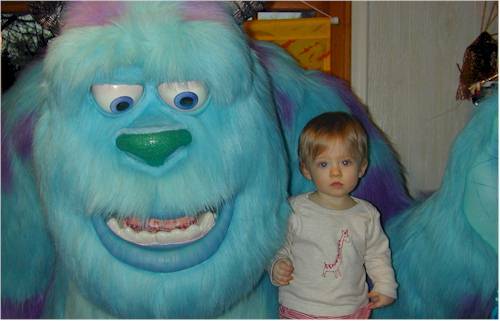 My twisted sense of humor found that tremendously funny, but I don't think I want the twins to grow up known as the kids whose dad killed Sulley. I got lucky, and both of the figures are in great shape. There are plenty I have seen at other stores that were pretty tore up by the kids, but both Mike and Sulley look terrific. But I had to get them in the house first. 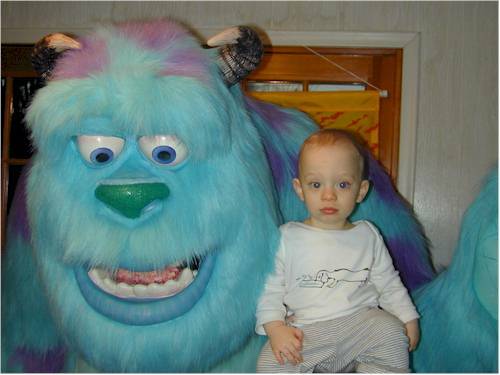 It took two trips to get them both home, since Mike had no place to sit when Sulley was filling up the back of the truck. 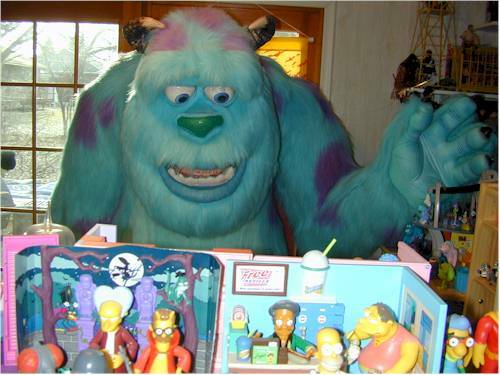 Mike was no problem getting in the house of course, but then came Sulley. Did I mention that he's HUGE? The instructions he came with said that if you removed his arms and head you should be able to get him in a 36" door. That's true, if you don't have a screen door in the way. Once I managed to unhook the hinges on the screen door, my son and I managed to maneuver him into the house. He came to rest in the living room, the first place we could drop him. I set him up there, but after a few days just couldn't take it anymore. He takes up about 36 square feet of floor space, not to mention the six foot of height. Did I mention he's HUGE? My wife and I then decided to haul him to the basement. Sure, I'm refinishing the basement, and I figured he'd look great behind the bar. But getting him down the hallway presented a new problem. The hallway is only 36" wide. Sure, he would fit through a 36" door, but only with some major gyrations. The hall is straight, so that's not an option. So off comes the tail. Now, it's not that bad. The tail is designed to come off, although it took more effort than the arms and head. But without the tail he *barely* fit down the hall. And then came the basement door. It's only 30" wide. So now I have a HUGE, blue monster standing in my kitchen. I bet you can guess my wife's opinion of having a HUGE blue monster in our kitchen. Now where to put him? 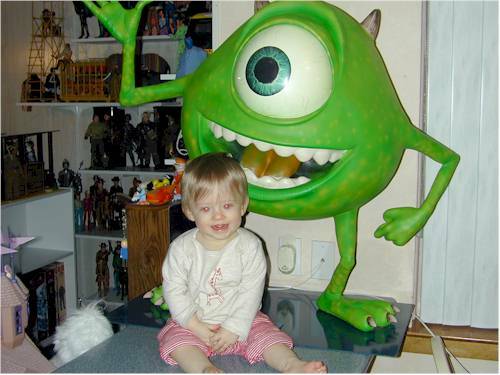 The obvious answer was the Toy Room. Heck, that's my room that I can goof around with in any way I like. My only little plastic Garden of Eden. But it's filled, and there were 12 new book cases filling the center of the room. But with a tape measure, a lot of effort, and about three hours of time, I found just the right way to re-arrange the book cases to get Sulley into the room, in a position that he isn't too crowded, and yet keep all my bookshelves. And that's his final resting place, at least for now. 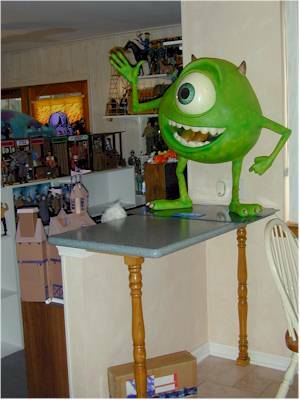 The photos on the page show Sulley (and Mike, hanging out temporarily on the counter between the kitchen and the Toy Room, until he makes his eventual move to the basement), along with the twins, Ethan and Mackenzie. 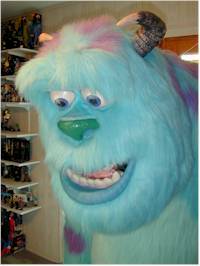 They aren't too sure about Sulley yet - did I mention he's HUGE? 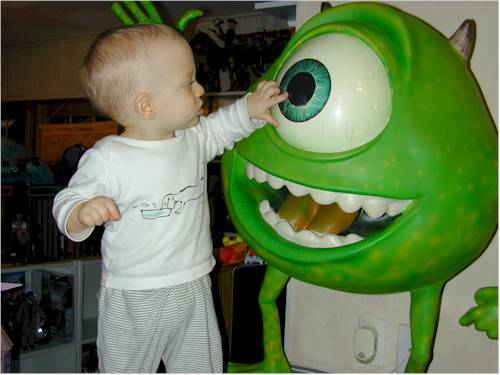 - but they both thought Mike was pretty darn cool.